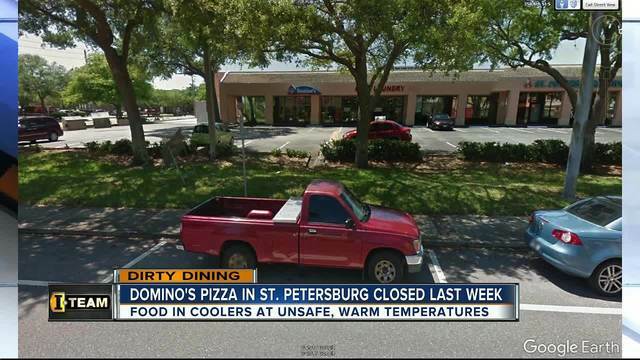 Domino's delivers specialty pizzas, pastas and more but last Wednesday, nothing was delivered from one of their popular locations in St. Petersburg. Dominos Pizza at 365 8th Street had to temporarily close on February 15 after inspectors found food at dangerous temperatures that could make you sick. The food items included Provolone cheese at 51°, sausage at 50°, Philly meat at 52°, hamburger at 50° and chicken at 52°. The state discovered the food at improper temperatures because equipment was in poor repair. That included the walk-in cooler at 51-degrees, three door reach-in cooler at 47-degrees, the reach-in pizza cooler at 52-degrees and the soda cooler in the front lobby with an ambient temperature of 68-degrees. All cold food and coolers should be at 41°or below. The state also saw employees touching ready-to-eat food with their bare hands, cutting bread for sandwiches and not washing their hands. Inspectors advised employees to wash their hands and put on gloves. Pizza boxes stored on the floor, employees with no required training as all certificates were expired, and equipment cleaner stored by racks of dough and on top of salad dressing packets. After finding 19 violations and shutting down the Domino's, the inspector came back the same day and issued another 10 violations with the 'time extended' to fix the issues. We spoke to Domino's Manager DiAngela Hutchinson over the phone tonight. She says the inspector shut down the shop due to that refrigeration issue and would not let them open back up until the coolers were under 41-degrees, which didn't happen until the end of the day. We also reached out to David Whitney, the public relations person at Domino's Ad agency of C,P, & B Global Network but he never e-mailed us back.